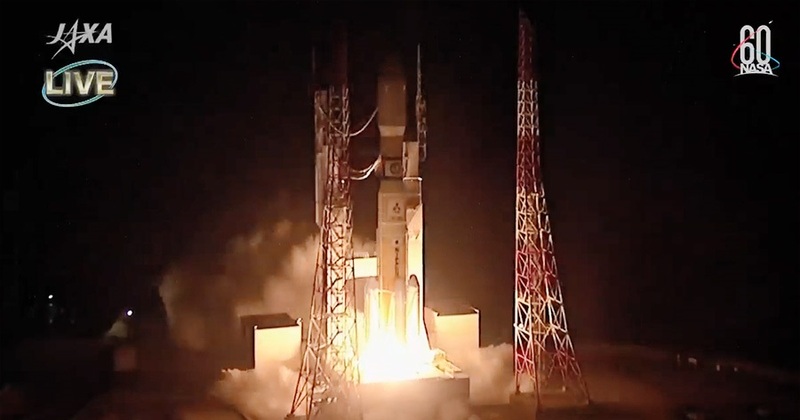 Japan’s seventh cargo resupply mission to the International Space Station lifted off from the Tanegashima Space Center in southern Japan to send more than six metric tons of cargo, including supplies to for the crew, new batteries and various experiments. HTV-7, or Kounotori 7 (Kounotori means white stork in Japanese), launched atop an H-IIB rocket at 1:52 p.m. EDT Sept. 22 (17:52 GMT / 2:52 a.m. local time Sept. 23), 2018. The cargo vessel is scheduled to arrive at ISS on Sept. 27. The flight was initially targeted for a 6:32 p.m. EDT Sept. 10 (22:32 GMT / 7:32 a.m. local time Sept. 11) launch, however adverse weather, including strong winds caused by a typhoon near Guam, forced the Japan Aerospace Exploration Agency (JAXA) to put the launch on hold and to reschedule the liftoff. Guam hosts the main ground tracking station necessary to maintain communications between flight controllers and the launch vehicle. After another examination of the weather, the launch was rescheduled to 4:59 p.m. EDT Sept. 14 (20:59 GMT / 5:59 a.m. local time Sept. 15), but this time the liftoff was scrubbed about two hours before the ignition of the H-IIB’s engines because of an issue with the rocket’s propulsion system and required a postponement of about a week to allow time for engineers to identify and solve the problem. JAXA then set Sept. 21 EDT (Sept. 22 local time) as the new launch date and when it seemed that all the obstacles in the way of a successful liftoff were cleared, adverse weather once again forced the agency to delay the flight by another 24 hours. Finally, the H-IIB was rolled out to the launch pad some 15 hours before the planned liftoff. After several hours of inspections and fueling, the countdown entered its terminal phase about an hour before ignition. At around T-minus minutes, control of the mission was handed to computers and the launch vehicle was switched to internal power. Five seconds before liftoff, the rocket’s first stage ignited its two LE-7A engines. At T-minus zero, the quartet of A3 Solid Rocket Boosters (SRB) came to life and the H-IIB began a short vertical ascent powered by six engines overall. After completing its vertical ascent, the rocket performed a pitch and roll maneuver and turned southeast to line up with the 51.6-degree orbital inclination of the ISS. The initial stage of the flight lasted nearly two minutes and concluded with the separation of the SRBs. With the quartet jettisoned, the H-IIB continued its mission powered by the core stage alone. Payload fairing separation occurred nearly four minutes into flight and the core stage finished its job at about six minutes into flight. Next, the second stage took control of the mission, igniting its single LE-5B engine to begin the task of inserting the HTV-7 craft into its initial orbit some 186 miles (300 kilometers) in altitude. The deployment of the spacecraft took place approximately 15 minutes after liftoff. HTV-7 is now in the process of catching up with the International Space Station. It will take about five days to reach the station’s vicinity where it is expected to be captured around 7:54 a.m. EDT (11:54 GMT) Sept. 27 by the station’s 57.7-foot (17.6-meter) long robotic Canadarm2 that will be operated by two Expedition 56 astronauts, Drew Feustel and Serena Aunon-Chancellor of NASA. The spacecraft is expected to be installed to the Earth-facing port of the station’s Harmony module. It will remain berthed to the ISS until mid-November 2018. HTV-7 was presented to the media on July 28, 2018, during a press briefing at the Tanegashima Space Center. According to JAXA, the spacecraft is loaded with about 6.2 metric tons of supplies, fresh food, water, spare parts and experiments. Developed by Mitsubishi Heavy Industries, the 23,100-pound (10,500-kilogram) HTV-7 spacecraft is about 33 feet (10 meters) long and 14.4 feet (4.4 meters) in diameter. The vessel consists of two logistic carriers—the Pressurized Logistics Carrier (PLC) and the Unpressurized Logistics Carrier (ULC), which also includes the Exposed Pallet, as well as an Avionics Module and a Propulsion Module. The ULC of HTV-7 is occupied by six new battery Orbital Replacement Units (ORUs) consisting of new lithium-ion battery cells weighing some 1.9 metric tons. The ORUs are slated to replace the station’s current nickel-hydrogen batteries. HTV vessels are capable of delivering six ORUs at a time. Two spacewalks are planned to replace the old nickel-hydrogen batteries with the new lithium-ion units. They were originally scheduled for September 20 and 26, but because of the delay of HTV-7’s arrival to ISS, they have been subsequently postponed. New dates for the EVAs are expected to be announced by NASA soon. Besides crucial supplies for the astronauts aboard the station, the cargo of HTV-7’s PLC (about 4.3 metric tons) includes two EXpedite the PRocessing of Experiments for Space Station (EXPRESS) Racks, namely EXPRESS Rack 9B and 10B. These are multipurpose payload rack systems that store and support research aboard the space station and enable quick, simple integration of multiple payloads. For JAXA, an essential payload inside the PLC is the HTV Small Re-entry Capsule (HSRC). This cone-shaped container, with dimensions of 2 feet by 2.7 feet (0.61 meters by 0.82 meters), is designed to demonstrate re-entry technology and cargo recovery from the space station. After the departure of the freighter from the outpost this fall, HSRC is expected to separate from the spacecraft’s hatch for a parachute-assisted splashdown off the coast of Japan and before being recovered. The PLC also contains ESA’s Life Support Rack (LSR), which includes equipment for a demonstration test of an “effective life support system” that produces oxygen from water using electrolysis. Another payload is the Life Sciences Glovebox (LSG), which will be the second large-scale glovebox for scientific experiments on the ISS and is expected to be installed in the Kibo module. Other payloads inside PLC include the Loop Heat Pipe Radiator (LHPR) technology demonstration system, the JEM Small Satellite Orbital Deployer (J-SSOD) and three CubeSats named SPATIUM-I, RSP-00 and STARS-Me, which were developed jointly by universities in Japan and Singapore. On the list of experiments being transported by HTV-7 are a new sample holder for the Electrostatic Levitation Furnace (JAXA-ELF), a protein crystal growth experiment at low temperatures (JAXA LT PCG) and an investigation that looks at the effect of microgravity on bone marrow (MARROW). The H-IIB rocket that was used for Saturday’s launch is a two-stage launch vehicle derived from the H-II rocket of the 1990s. Standing just slightly taller than both rockets in the H-II family at 183.7 feet (57 meters), it uses liquid oxygen and liquid hydrogen propellant to power its two LE-7A first stage engines and single LE-5B second stage engine. Additionally, four strap-on solid-fueled boosters are utilized for the first two minutes of flight. The rocket was designed to send Kounotori spacecraft into orbit and has been used exclusively for that purpose since its first launch in 2009 with HTV-1. HTV-7 is Japan’s fifth orbital mission in 2018. The country’s next launch is slated for October 29, 2018, when an H-IIA rocket is planned to orbit several satellites, including CubeSats, for Japan and other countries.